When anyone talks about surfing typically people think of the big waves of California and Hawaii . However, for those who are interested in surfing for the first time, there are numerous great destinations in Europe to catch your first wave, as well as less well-known spots in the California area that are not just for the pros. 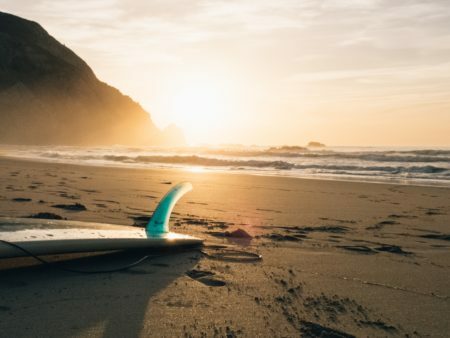 On top of that, if you are considering learning a new language or improving your language skills then you can combine surfing with a language course – ensuring that you know how to ask the locals where the best surf spots are! Biarritz, on the Bay of Biscay, is one of the best places for new surfers to find their feet on the board. This French coastal area is a year-round surf location and the famous reefs of Guéthary and Lafitenia are one of its main attractions. From the beautiful beaches and coves in Anglet to the winter reefs around Guéthary, there is always something to look forward to in the French Côte Basque, regardless of the season. Check out our French + Surfing course in Biarritz imparted by certified professional surfing instructors. San Sebastian, with its oceanic climate and the characteristic Gulf Stream of the Basque Coast, provides all levels of surfers with good waves throughout the year. Although the warm summer in the Basque Country is the perfect time of the year to visit San Sebastian, the water temperature rarely goes below 11 degrees during autumn and winter. Places like Mundaka, Orrua or Lemoiz are well-known for their optimal weather conditions and great waves. Learn Spanish and Surfing in San Sebastian with us and discover all the Basque Coast has to offer. The warm hospitality and weather of the largest of the Canary Islands all year round make it a visitors heaven that rarely drops below 20 degrees during the day. In addition, its world-class surfing spots place Tenerife as one of the best surf destinations for anyone who wants to be at one with their board and the water. The city hosts remarkable international competitions as well. The volcanic island has a lot of beautiful dark sand beaches that produce good left and right hand walls of water for beginners such as El Arenal, El Conquistador, La Tejita or El Lobo. The Algarve is a favourite in Portugal for visitors as well as for surfers. Its relaxed atmosphere, wonderful white sand beaches and the widest swell window in the country, attract surfers from all over the world, especially those escaping the cold winter of northern Europe. Faro’s water is the warmest in the Portuguese coast and beginners can enjoy the waves of Praia de Faro and other nearby good surf spots such as Albufeira, Falesia-Vilamoura or Praia da Rocha. California has one of the best conditions for surfing during any season, probably only beaten by Hawaii. Its excellent sunshine, Santa Ana wind and swell exposure bring countless locations and opportunities for both learners and seasoned surfers to catch great waves. Some of the best spots for beginners in Los Angeles area are the accessible El Porto in Manhattan Beach, Zuma Beach, just north of Malibu, Sunsets or Bolaa Chica State Beach. Next Next post: Get the Work Flexibility of Your Dreams with TEFL!